A Highland Christmas is a standalone holiday novel in M.C. Beaton's Hamish Macbeth mystery series, though it was the 16th book released in the series. 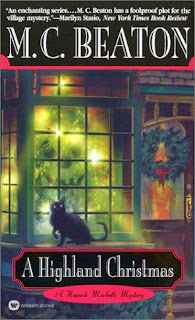 It's Christmas in the small Highland town of Lochdubh, Scotland, and Hamish Macbeth is called upon to investigate not a murder, but a set of missing Christmas lights and a crabby old lady's missing cat. A Highland Christmas is very short in length, though perfectly enjoyable to read during the holiday season. The Scroogey-lady whose cat goes missing even softens by the novel's end. Fans of M.C. Beaton's novels will truly enjoy their time with A Highland Christmas! The books that follow A Highland Christmas in this series are Death of a Celebrity, Death of a Village, Death of a Poison Pen, and Death of a Bore. What are your favorite Christmas holiday reads? Share your thoughts with us below.